(Bloomberg) -- President Vladimir Putin signed laws punishing online media and individuals for spreading “fake news” or material that’s considered insulting to Russian officials. Prosecutors can now complain about online publications to the state communications watchdog, which has powers to block access to the websites if their owners fail to remove the material promptly. Publications found guilty of spreading “unreliable socially significant information” may face fines of as much as 1.5 million rubles ($23,000). The measures were attacked during their passage through parliament by the Presidential Human Rights Council, which warned of their potential use as methods of repression against critics of the authorities. Putin signed the legislation after thousands of people protested in Moscow earlier this month against Kremlin plans to establish a “Sovereign internet” that would route online traffic mostly through domestic servers and exchanges. Opponents say the move will enable officials to cut off access to services such as Facebook and Google as well as websites critical of the government amid growing public discontent on issues such as rising prices and increases in the pension age. 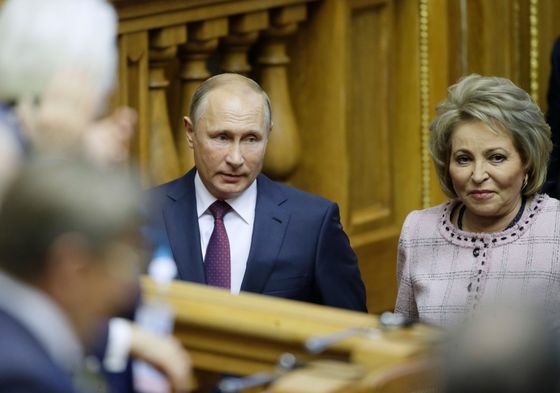 Valentina Matviyenko, a key Putin ally who heads the upper house of parliament, laughed off the impact of the new laws last week, however, citing jokes that Russians had made about the legislation.